The list of disease processes that cause abdominal pain is extensive. 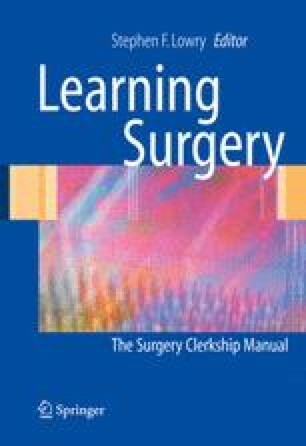 Most of these maladies never require surgery; however, recognizing when emergent, urgent, or elective operative intervention is required is a necessary skill for general surgeons and most physicians. Starting with a directed history of the nature of the pain and the associated symptoms, one can begin to formulate a differential diagnosis. The past medical and surgical history often provides additional clues as well as a picture of the patient’s overall condition. The physical exam is critical. Understanding that the rigid abdomen seen with free air and the involuntary guarding seen with peritoneal irritation are signs of surgical emergencies is the first step. Further refinement of diagnostic skills comes with the number of abdominal exams one performs. The history and physical combined with laboratory and imaging studies usually provide enough information to determine if the patient has a catastrophic abdominal emergency, an urgent surgical condition, an elective surgical condition, or a nonsurgical condition.